The following family surnames have genealogy eBooks on this page: Britton, Brush-Bowers, Burgner, Copeland, Decatur, DeVeaux, Elers, Emmons, Goodhue, Munsey-Hopkins, Pringle, Rogers, Spotswood, Steele, Talley, and Towner. 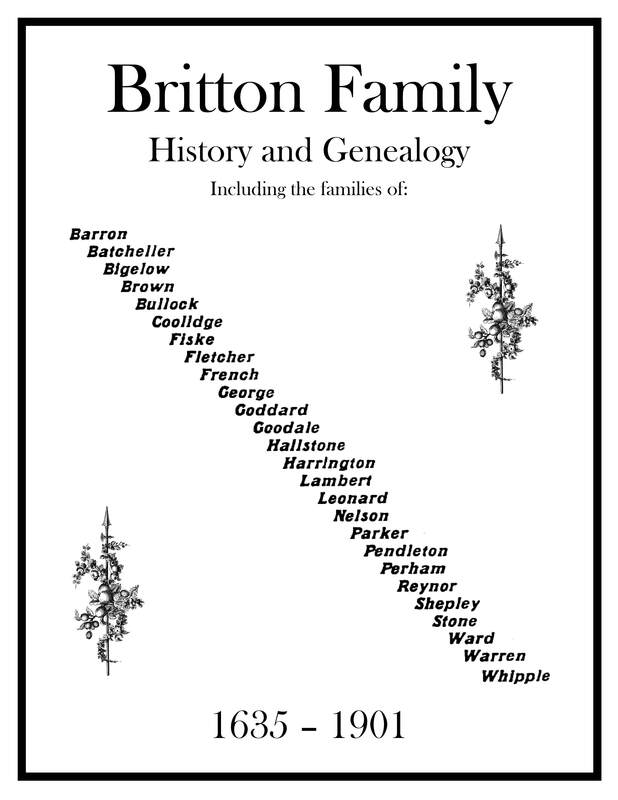 Britton Family History and Genealogy PDF eBook English 2.56 MB 1901. There is a tradition that the first Britton family member to arrive in America came from the family residing in Yorkshire, England. Also in this publication, family lore steps further back in time to the year 1239. Vital names and dates of ancestors and in-laws cover a period of 266 years, from 1635 up to 1901. There are interesting short biographies, and a list of 26 surnames with kindred ties to the Britton family! A wealth of information for the family genealogist! Price $6.95 USD. 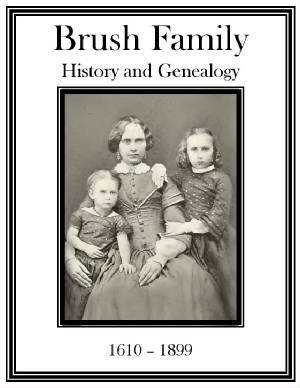 Brush Bowers Family History and Genealogy PDF eBook English 7.64 MB 1904. About the year 1665 Thomas Brush and a native named Chickinoe of the Massapequa Tribe, set boundaries on land in New England purchased for pioneers. This being one of many tales, there is also family legend that dates back to 1066 in this publication. Along with numerous photographs, and etchings, vital dates with names range from the year 1610 up to 1899, covering a period of 289 years! This is great information on one of Americas long standing Colonial families! Price $6.95 USD. 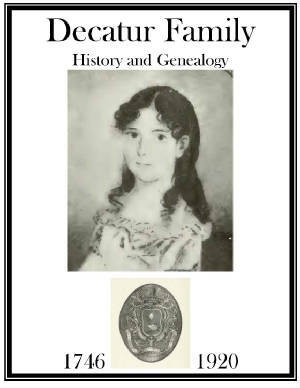 Decatur Family History and Genealogy PDF eBook English 2.65 MB 1921. From LaRochelle, France, Stephen Decatur entered the French Navy as a Lieutenant and was stationed in the West Indies. He eventually immigrated to the American Colonies and Rhode Island became his home in 1746. His adventure and descendants are listed in this great insight to the early 1700s. Covering 174 years, from 1746 up to 1920 with vital names and dates, you may be reminded of seafaring days of long ago as you read! Numerous rare ancestral photographs. A great link to Decatur genealogy! Price $6.95 USD. 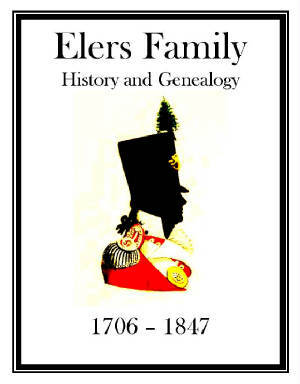 Elers Family History and Genealogy PDF eBook English 16.5 MB 1903. Numerous correspondence and other papers with genealogy and notes will be found in this resource. Stemming from the memoirs of George Elers it is an absolutely fascinating account filled with many tales that cover the time period from 1706 to 1847. You will embrace the time of the American colonial period from the pages of this Captain in the 12th Regiment of Foot! A great link to the past for the Elers family! Price $6.95 USD. 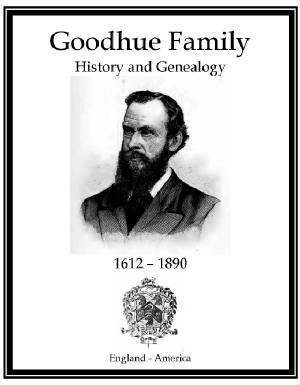 Goodhue Family History and Genealogy PDF eBook English 20.6 MB 1891. A fascinating history of Goodhue family lore extends back to the year 1280 where the family originated in Kent, England. Emigrating to America in 1635 the names of ancestors with vital dates range over a period of 275 years, from 1612 up to 1890. Many ancestral etchings are included along with an 80 page index containing thousands of descendants and in-laws! A treasure of information for the family genealogist! Price $6.95 USD. Coming Soon! 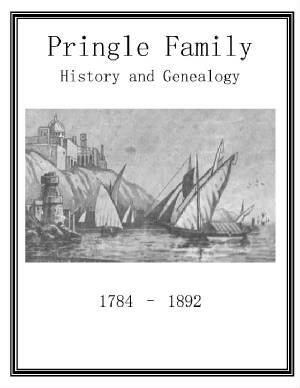 Pringle Family History and Genealogy PDF eBook English 3.27 MB 1892. This surname is prevalent in the south of Scotland where there is a great deal of ancient family legend that dates back well before 1388. Vital names and dates from 1784 up to 1892 are contained in this wonderful account of Pringle kinship ties through many centuries! It is most certainly a great link to the past for the Pringle family genealogist! Price $6.95 USD. 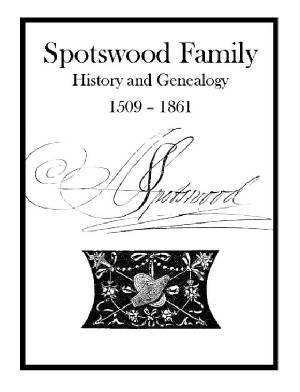 Spotswood Family History and Genealogy PDF eBook English 2.03 MB 1868. Originating from Spottiswoode in the Parish of Gordon, County of Berwick, in the land of Scotland, the family emigrated to the American Colonies. There are Archbishops, scouts, trail blazers across the wilderness, along with plantation slave owners and a deep sense of colonial patriotism! Vital names and dates range from 1509 up to 1861 with Wills dating into the mid 1700s. A fascinating resource loaded with history and inspiration! Price $6.95 USD. 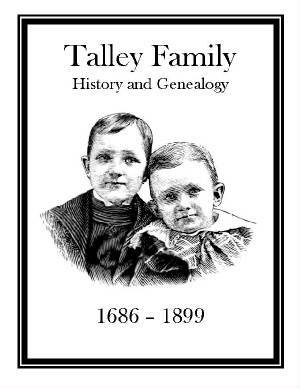 Talley Family History and Genealogy PDF English 12.8 MB 1899. Many interesting biographies, poems, a Civil War soldier listing, photographs and etchings will be found in this wonderful resource of Talley family heritage. Names and dates span the years from 1686 up to 1899, and you will find an eleven page index with over a 1000 descendants and in-laws listed! The early history of the family will certainly be appreciated by any family member! Price $6.95 USD. Burgner Family History and Genealogy PDF eBook English 11.6 MB 1890. About the year 1734 David, Christopher, and Peter Burgner emigrated from the vicinity of Berne, Switzerland and settled in Lancaster County, Pennsylvania. From the Fatherland they each brought a fifteen pound Bible which they began using to keep brief family records. From this and other sources vital names and dates ranging from 1734 up to 1890, covering over 150 years of Bergner genealogy, is found in this publication! There are numerous illustrations of family members, and a 10 page index listing over a thousand names of descendants and in-laws! 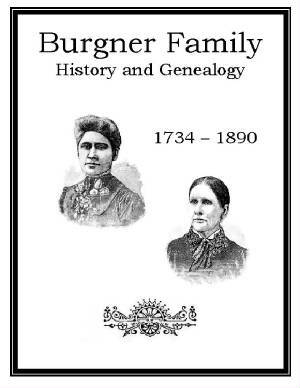 A wonderful resource for the Burgner family genealogist! Price $6.95 USD. 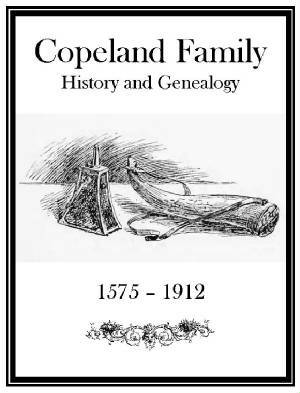 Copeland Family History and Genealogy PDF eBook English 837 KB 1914. The Copeland Clan, of Scottish background, is referenced by the author to the book The Scottish Nation published in 1910, which provides history back to Sir John Copeland in 1346. There are 10 generations herein listed with vital dates ranging from 1575 to 1912. This publication is mostly in a chart format on the left side of the page with notes and authorities quoted on the right of each page. Although only 12 pages in length, it is a great link to the past with over 3 centuries of genealogy! Price $6.95 USD. 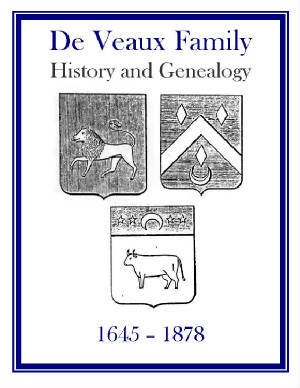 DeVeaux Family History and Genealogy PDF eBook English 10.7 MB 1885. A great family history is told as the DeVeaux, De Voe, or De Vaux family left Europe as Huguenot refugees. Vital names and dates range from 1645 up to 1878 along with great biographies of ancestors coupled with fascinating individual stories. Poetry, ancestral letters, and many Coat of Arms from various family branches provide a wonderful resource. An essential resource for the family genealogist! Price $6.95 USD. 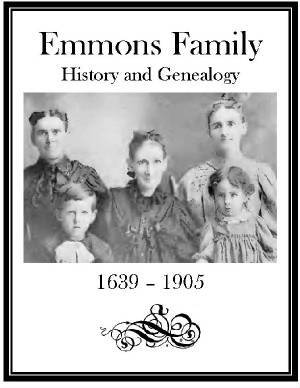 Emmons Family History and Genealogy PDF eBook English 14.6 MB 1905. Numerous rare ancestral photographs accompany this resource that starts with the story of emigrant Thomas Emmons to the American Colonies. Vital names and dates range from 1639 up to 1905, which provide over 260 years of information on a multitude of his descendants. If you are an Emmons family member this genealogy may be yours! Price $6.95 USD. 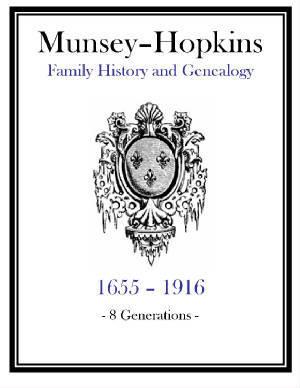 Munsey-Hopkins Family History and Genealogy PDF eBook English 10.6 MB 1920. Eight generations of descendants from William and Margaret Munsey span the years 1655 up to 1916 in this well sourced publication. The origin of the Munsey family name is in the lore that dates back to Roman times. Pedigree charts, and great short biographies, accompany the documentation of the Hopkins family, which dates back to one of the Mayflower passengers! An index of 30 pages lists thousands of ancestors and in-laws in this fascinating history! A marvelous resource for documenting genealogy! Price $6.95 USD. 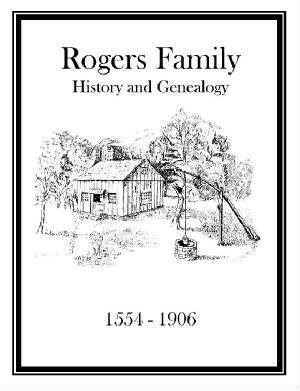 Rogers Family History and Genealogy PDF English 1.70 MB 1907. The Reverend John Rogers became a martyr, and was burned at the stake in the year 1554. His grandson John Rogers, who is also a Reverend, and his wife Susannah immigrated to the American Colonies in 1708 where they raised their children. And, the family grew! Vital names and dates of Rogers family members range from 1554 up to 1906 in this great resource! A wonderful reference for documenting essential names and dates! Price $6.95 USD. 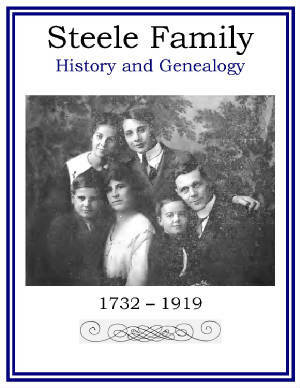 Steele Family History and Genealogy PDF eBook English 17.6 MB 1919. James Steele was a pioneer, generous hearted, courageous, and an optimistic man right up to his death at the age of 108. Vital dates and names of his descendants, and wife Mary, range from 1732 up to 1919. There are numerous rare ancestral photographs of people and places with intriguing stories that cover the span of 187 years! A well written presentation of the family legacy! Price $6.95 USD. 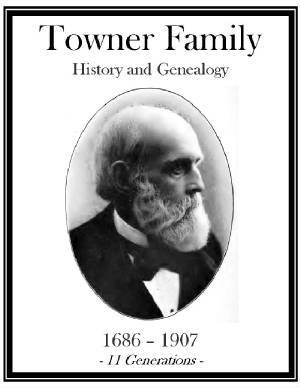 Towner Family History and Genealogy PDF eBook English 1910. From Sussex County, England the adventurer Richard Towner arrived in Guilford, Connecticut just before 1685. There are eleven generations of his descendants listed, which span the years from 1686 up to 1907. It is written: Tis opportune to look back upon old times and to contemplate our forefathers! There are 25 pages of index that list over 2,000 names of descendants and in-laws. You will learn of: the rocks, which have long been known as Towners Cave. A great resource of history and genealogy! Price $6.95 USD.